The Mackie Thump Series Thump12A Active PA Loudspeaker delivers an enviable amount of power with deep low-end response right through to a clear high-end output. The portability being just as importance as performance, the 12A is lightweight yet robust to ensure the best of both worlds. 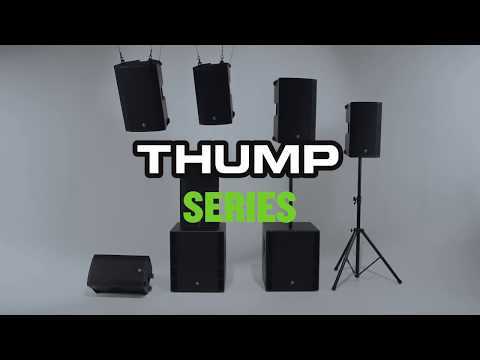 If it's high performance at an affordable price that you're after, then the Mackie Thump Series has you covered. Equipped with a 12-inch high-output woofer, the Thump12A boasts a hefty 1000W low frequency output, whilst the 1.4-inch titanium dome compression driver handles the 300W high-frequency output deftly thanks to the ultra-efficient Class-D amp. You can rest assured that thanks to the next-generation system protection that Mackie have put in place, everything runs as efficiently as possbile, without the chance of thermal overheating. Built-in active compression provides a line of defence for the drivers. The built-in 2-channel mixer includes Vita preamps with Wide-Z technology, which handle mic/line/instrument signal with the greatest of ease. The XLR-thru output allows for easy connectivity with other Thump loudspeaker for easy setup and installation of any rig-size. You can mount the speakers onto a tripod or pole, whilst the dual-angle design makes the speaker perfect as a stage monitor too. Whatever you're doing, the Mackie Thump Series speakers can be optimised by choosing the specific mode to cover the application, e.g. music, speech, etc. Frequencies are split via the precision crossover, which ensures that low and high frequency signals are projected to arrive at your audience at exactly the same time. As noted above, the Mackie Thump Series 12A Active PA Speaker is lightweight with a 4-handle design that makes it easy to carry. The enclosure is built for heavy duty use, so you can be safe in the knowledge that it is well up to handling life on the road.